Sweeping is easy, but picking up every little speck of dust or dirt is tricky. This article from The Spruce has some great tips on how to sweep without leaving anything behind. We’ve got all kinds of nifty gadgets that have tried to replace our brooms, but the truth is that every home still needs to have a classic broom. A broom is a great tool for a quick pickup or intense floor cleaning. Find out how to make sweeping your floors a more effective and efficient way of cleaning your home. Although the time required will vary depending on the room and size of the floor, sweeping is a fairly easy task to take on. Luckily, you only need three items to get started: a broom, a dustpan, and a trash can. Find a broom that fits with your floor type. Smoother floors can get by with synthetic brooms, while rougher floors may need natural fiber brooms to be just as effective. Choose a broom with an angled edge for cleaning under cabinets and in tight spaces and make sure your broom is at a comfortable height, and not too heavy to manage. While there are over 200+ types of brooms out there, you can find one of the 14 brooms recommended by The Sweethome researchers. When sweeping a room, there are a couple of different methods to consider. Some people like to walk the perimeter of a room, sweeping from the edges into a pile in the center. Others prefer to begin at one end of the room and move to the other, pulling the dirt pile along with them, or eliminating the pile in sections. Choose a method and starting point that works best for you. Sweeping isn’t a difficult motion to master, but you want to try to keep continuous contact with the floor without pressing the broom strands down into the floor. Begin on a section of the floor that is away from your body and gently drag the broom toward your body. You can use short quick motions or long sweeping motions to get the job done. Choose a sweeping style that best fits your personal preference. Next, you want to sweep dirt into a pile. After all the dirt is in a pile, sweep the dirt pile into a dustpan and then deposit it in the trash. 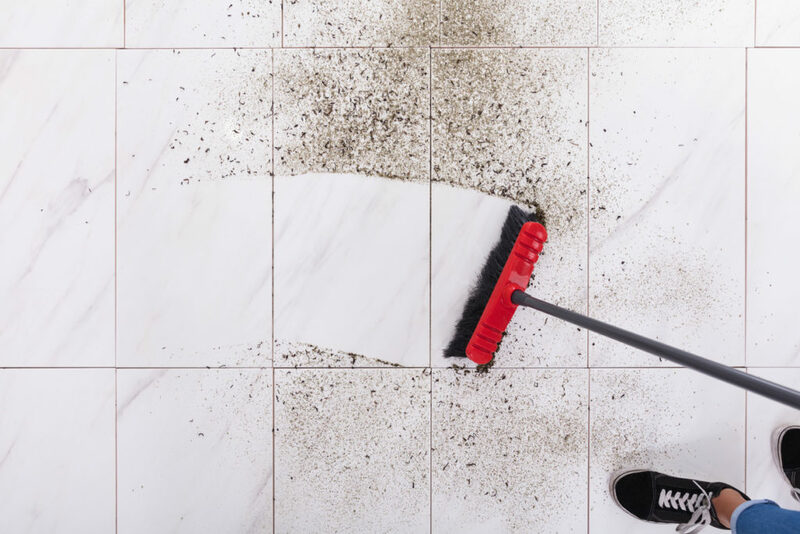 Be careful not to dump the dirt too quickly, as this may cause dust and dirt to billow back into your face, or onto your clean floor. After you are done sweeping, put away all of your sweeping supplies and be sure to clean your broom as needed. Hang your broom to prevent the bristles from becoming bent or damaged, or sit the broom upside down for storage. Avoid getting your broom wet. It damages the broom and shortens its life span. When washing a broom, make sure that it dries thoroughly upside down, to prevent bristles from being bent or damaged. Sweep as needed on a daily basis. There is no set schedule for sweeping. Looking for more shine and stain removal on your tile floors? Contact us today at J and R’s Carpet Cleaning to schedule a professional tile and grout cleaning!